I love lists. I made list for everything, since shopping to what todo today ... Even lists of options for movies or food. But one of the most usabilities for lists for me is, ToDo lists for tasks to work on. Create an specification for this. Clone the button from screen X to screen Y, changing his color. This app has a friendly layout, easy to deal with and has an historic for all my notes (at the left side). But I couldn't create an efficiently ToDo list on it. I googled about and found a little bit more than I wished for... So I'm looking for a recommendation since Mac OS X is blessed (or perhaps plagued) with more to-do apps than you could ever use. Possible way to see all lists that I have. Easy to work with (Clean and objective UI). Add notes or small sumaries about the ToDo List (Sometimes I forget what exactly is the list with just his title) . Possible to add notes to itens on the checklist (Instead of keep open parentheses, and others "tags" to increment the description of the item. would be nice to be able to add a small note about it. and let the item be more direct on the point). Yup. 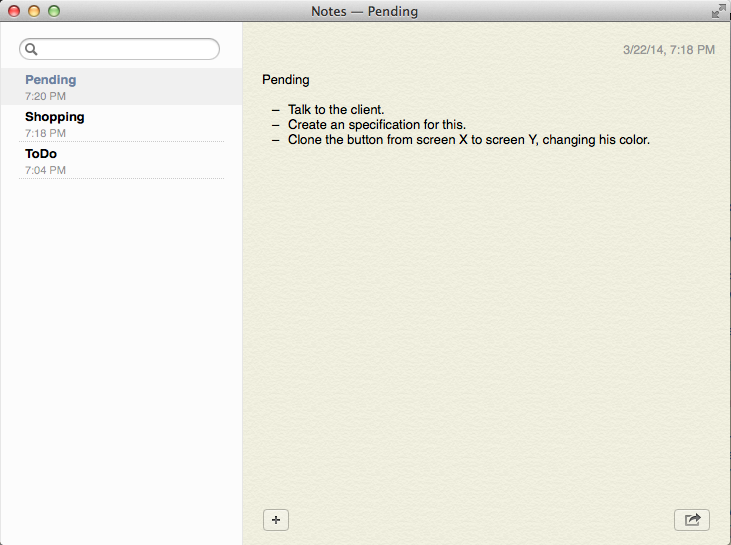 I'm a Mac user and Wunderlist is perfect. Sometimes, it can feel a little heavy, but mostly no issues. Yes. There's a sidebar with all your lists, and lists that Wunderlist makes for you. For example, a list called "Week" pops up when something is due this week, and hides when there's not. Yes. It's very to-the-point app with no ads and no frills. No. I have never really felt like I needed this. Maybe you should try giving more descriptive names to lists? Yes. Not sure what you mean here. But Wunderlist has cloud sync, and you can attach files to an item as well. Yes. But obviously, sync won't work. Yes. I'm a free user. Yes. I'm an Android user. The experience is very desktop-like. Yes. I love this about Wunderlist. Other than notes, you can add a checklist in an item too. Possible create folders to store Lists. No. Lists are lists. I think if you need folders to manage lists, you're doing to-do wrong. I would say Wunderlist is amazing, and a perfect option for you given your need! It uses plain-text syntax to create lists, therefore, even if there's no Android app, you can still open your lists with any plain text editor. Content is synced via Dropbox. You get a nice sidebar with all your lists, can add notes to your tasks and folders of lists. Not free, but cheap: you can get the Mac version for $5.99 right now. Not the answer you're looking for? Browse other questions tagged osx time-management or ask your own question.